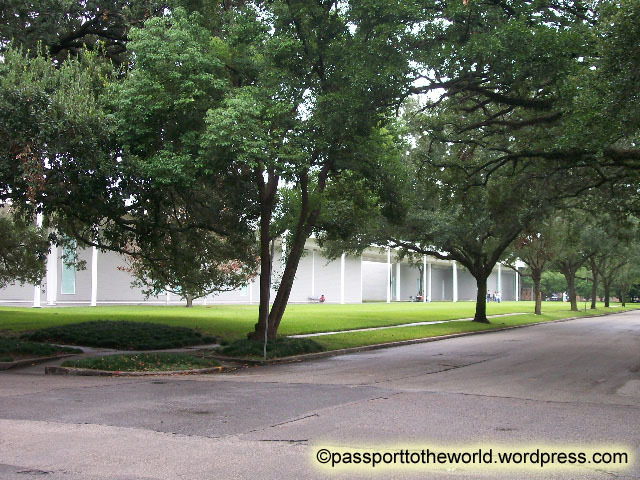 The Menil Collection is an art museum started by the Menils, who were French. The wife, Dominique de Menil was the daughter of Conrad Schlumberger, founder of Schlumberger oil services company, which has a headquarters in Sugarland/Missouri City. She and her husband John de Menil came to Houston after WWII and her father put her husband in charge of Schlumberger’s overseas operations. They were avid art collectors and philanthropists who promoted the arts in Houston. The museum was created to showcase and preserve their private art collection. This is a decent sized museum with a varied collection of art from around the globe. Knowing that all of the works of art belong to just this one family make it all the more impressive. The museum has artwork and ancient arts from Greek, Roman, Medieval/Byzantine, African, Oceanic, and Northwest American cultures, with some Asian works. Most impressive was a long wooden table from 1500’s Europe. It was a rich dark color and you could see the age and wear of the table; the rougher, but high quality craftsmanship of the day, and all the details of wear and usage over time. What surprised me was this antique was just out in the open in the hallway exhibit space. You would think a 500-year-old antique would be more protected, like in a glass case or sectioned off. It was just neatly displayed with plaques explaining the art, but there was no glass case or ropes sectioning it off. Absolutely nothing. So you could get up real close to scrutinize the detail and see how it was put together. Awesome! Some other things of note were the Byzantine and Egyptian art. The artwork was done on wool or cloth and from thousands of years ago. Most of it has deteriorated but you can still see the painting. Wow. This museum is a definite must see in Houston for art and history/culture buffs. There’s some really cool stuff here that is worth checking out. A quick tour might take 30-45mins, and if you really stop and admire the works of art it might take 2+ hours. The fact that it is free is a real plus and makes it easy on the budget. Free Parking/免費停車: 1515 West Alabama St.